The road safety network in WA is made up of a wide range of individuals and organisations, all with an interest in working together in a partnership approach to make their communities safer. It is thanks to the resources of this network that so many road safety activities take place every year across the state. The time contributed by individuals to plan and implement road safety actions; facilities and equipment provided by Local Governments or State Government agencies; and sponsorship by local businesses are all examples of resources contributed by the network. The extent of these contributions reflects the collaborative nature of the network in working together for a common goal. WALGA’s RoadWise Program recently completed a project which sought to explore and quantify the level of financial and in-kind contributions made by the road safety network, supported by RoadWise, to enable local road safety activities to be planned and implemented. Data was collected for a three month time frame (February – April 2015) which included the number of paid and unpaid hours contributed by individuals, resources provided to support road safety activities, financial support for committees, and the provision of hosting and storage. Values were allocated to each element using either a market value or direct costs method. The results of this research have been published as the Estimating the value of contributions to community level action for road safety report. The Estimating the value of contributions to community level action for road safety report was launched on 11 May at an event which showcased the contributions of members of our 4700-strong community road safety network. Click on the links below to find out more about the celebrations. 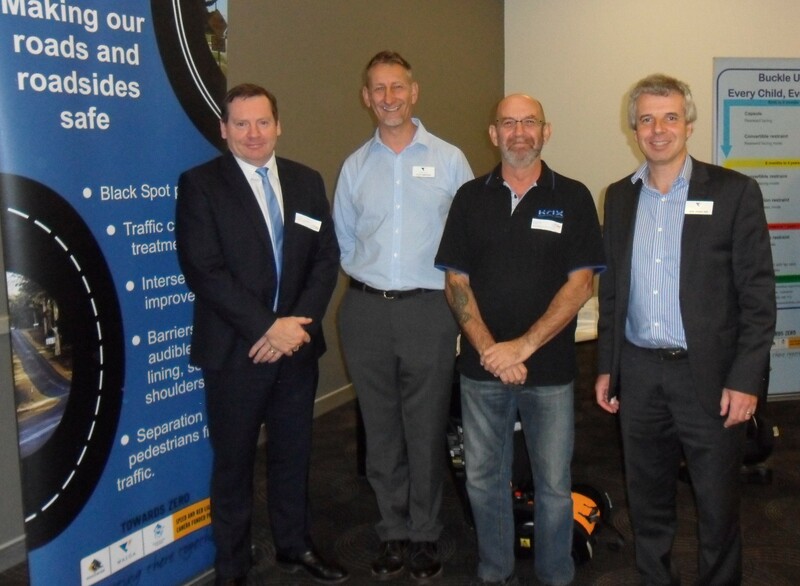 Pictured above: The Road Safety Commission's Chris Adams, WALGA's Cliff Simpson, Motorcycle Riders Association of W.A. Inc's Dave Wright and WALGA's Ian Duncan. The total value of in-kind and financial contributions generated by the community road safety network across WA in the three month period 1 February – 30 April 2015 was $404,321. On an annual basis, this represents a contribution of around $1.62 million. It is estimated that individuals in the network contributed more than 4000 hours to road safety during the reporting period. Extrapolating this represents over 16,000 hours on an annual basis. This commitment enabled the delivery of 983 road safety activities. Local Government staff and Elected Members contributed 61% of all hours, and the sector contributed 49% of the value of contributions in total. This in an indication of the level of commitment and support by Local Governments to community road safety partnerships. The contributions have come from metropolitan, regional and remote areas of WA, with differences between regions reflecting the varying levels of activity and capacity within each region. To access a copy of the report or the report brief, complete the download form. Visit the WALGA website to read the media release or find us on Facebook and Twitter. 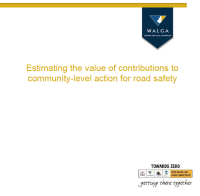 Source: Western Australian Local Government Association (WALGA), Estimating the value of contributions to community-level action for road safety, WALGA, September 2015.